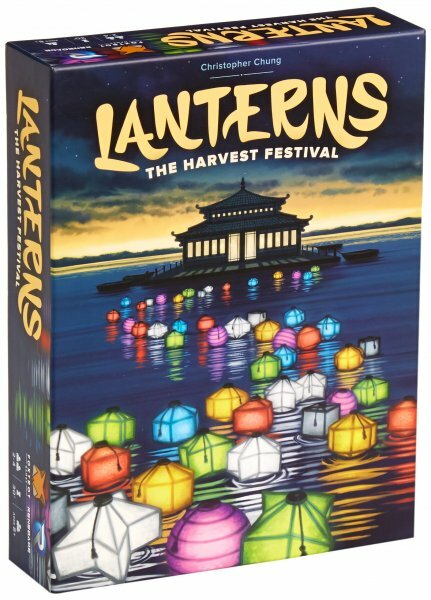 Lanterns: The Harvest Festival is a tile placement game set in imperial China. Players act as artisans decorating the palace lake with floating lanterns. The artisan who earns the most honor before the festival starts wins the game. Lantern’s elegant and engaging game-play by designer Christopher Chung features a unique mechanic were players must balance the placement of their tiles or risk helping their opponents on their way to victory. It’s a give and take that provides hours of depth and strategy. On a turn, a player places a tile depicting various color arrangements, and every player receives lantern cards based on the tile placed. Players dedicate sets of lantern cards to gain honor and favor.